Odour Buster™ Original is a premium, clumping cat litter made from responsibly mined, superior-quality clay and eight exclusive odour and bacteria eliminating ingredients. It was developed from a formula originally created to control odours in the toughest agricultural settings: pig and chicken farms. If the Odour Buster™ recipe can eliminate odours in chicken coops and pig pens, imagine what it can do for your cat’s litter box! Odour Buster™ Original is available in 6Kg and 14Kg bags as well as a 9.1Kg pail. Odour Buster™ Original is made from premium-quality clay and eight natural odour and bacterial eliminating ingredients. Our litter is safe for your cat, family, and the environment. Why choose Odour Buster™ Original? Odour Buster™ Original is proudly made in Canada using premium quality ingredients that are safe for your cat, family and the environment. Our manufacturing process is carefully controlled to ensure that our litter is completely dedusted and coated with the Odour Buster™ recipe for the safety of your cat and the comfort of your entire household. 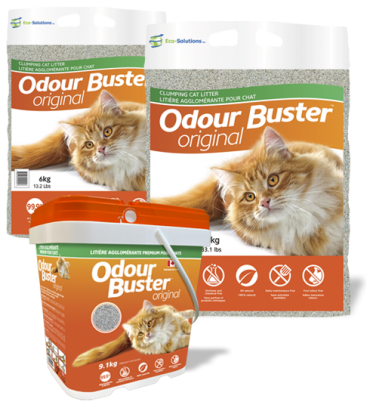 Odour Buster™ Original is completely dedusted for your cat’s safety and the comfort of your entire household. This is accomplished by constantly controlling the litter’s humidity levels during production and passing it through several dedusting stations prior to packaging. The Odour Buster™ recipe, made from eight exclusive odour and bacteria eliminating ingredients, was originally created to control odours in the toughest agricultural settings. If Odour Buster™ can eliminate odours in pig pens and chicken coops, imagine how well it can work for cat litter! With Odour Buster™ Original your cat’s litter will remain odour free even if you don’t scoop every day. Odour Buster™ Original eliminates odours without the need for any added chemicals or perfumes. Odour Buster™ Original is made from premium-grade, natural ingredients only and is safe for your cat, family, and the environment. Learn more about bentonite and responsible mining here.